Riku is Sora and Kairi's best friend and an original character created by Tetsuya Nomura for the Kingdom Hearts series. Nomura has stated that Riku's name can be seen as "land"; the Japanese on'yomi pronunciation of land is riku. Riku is voiced by David Gallagher in the English version and Mamoru Miyano in the Japanese version. He is playable in the second story mode of Kingdom Hearts: Chain of Memories and as a world-specific ally in Kingdom Hearts II. At the beginning of the series, he is 15 years old and lives on Destiny Islands with his friends. When their world is attacked by the Heartless, the three are separated. Riku ends up at Hollow Bastion where he is found by Maleficent. Under her influence, he becomes an antagonist to help Kairi. Riku eventually becomes possessed by Xehanort's Heartless, the main antagonist of the first game, and is sent to the realm of darkness, where he helps Sora seal the door to the realm of darkness. In Chain of Memories, he awakes in the same fortress Sora had arrived at and begins traversing to the top from the basement. Along the way, Riku confronts the remaining darkness in his heart, and also encountered DiZ, a mysterious stranger. Upon reaching the top he finds Naminé, who is attending to a sleeping Sora to restore his memories. Riku then chose to find a balance between his light and darkness. 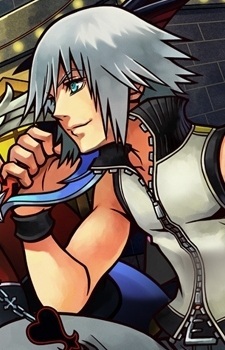 A replica of Riku was created by Vexen in Castle Oblivion during the events of Kingdom Hearts: Chain of Memories and was referred to simply as the Riku Replica. After the events in Chain of Memories, Riku confronted Roxas in order to assist DiZ in reuniting him with Sora. During the fight, he used the power of darkness, which converted Riku into the form of Xehanort's Heartless. For most of the story, Riku remains in this form, helping Sora in secret and never showing his face, not wanting Sora or anyone else to discover what had become of him. Riku returns to his original form by the destruction of a machine intended to convert Kingdom Hearts into data. Afterwards, Riku and Sora battle and defeat Xemnas. In the end, they end up on a dark beach, and discuss how strong their friendship is and how much each of them wanted to be like the other, before a portal opens to Destiny Islands. The two use the portal and are sent home.